The synthetic treatment of very large data sets by Simmons (1993) and Silcox (2001) is very interesting. Simmons searched for all possible morphological characters studied in the literature, established in 10 presumably mono-phyletic units (Scandentia, Strepsirhini, Tarsiiformes, Anthropoidea, Galeopithecidae, Megachiroptera, Microchiroptera, Plesiadapidae, Paromomyidae, and Micromomyidae). The most striking result of her analysis is that, in partitioning the data set into six different subsets corresponding to different anatomical systems, despite the elimination of three fossil families to avoid too much missing data, six different phylogenies were obtained. Nonauditory cranial (33 characters), auditory (20), anterior axial skeleton and forelimb (31), hindlimb (35), reproductive tract and fetal membranes (12), and neural (23) data sets—all gave different phylogenies that sometimes did not recover primate or chiropteran monophyly (Simmons, 1993). In spite of her will to be as objective as possible, Simmons (1993) made one big decision that affected her results—the exclusion of dental characters. On the one hand, this is understandable. It is common experience that the dentition is "very useful in differentiating species and genera, but at higher taxonomic levels its value is diminished because it is particularly subject to parallel evolution" (Butler, 1980). Moreover, dental characters are also subject to numerous successive transformations, rendering the a posteriori deciphering of successive states difficult. However, on the other hand, all characters are susceptible to convergence and successive transformations, and dental characters do not appear more affected by homoplasy than others (Sanchez-Villagra and Williams, 1998). As dentitions constitute a large part of the fossil record, their importance should not be undervalued (Silcox, 2001; Van Valen, 1994). 1. There is no strong phylogenetic signal contained in Simmons' summary data set; it is sufficient to replace the treatment of the 154 characters from equal weight given to each change in a character to equal weight given to each character to completely lose primate monophyly and find the Anthropoidea as the sister group of Dermoptera + Chiroptera (Simmons, 1993, Figure 8). If the character transformations that can be ordered are ordered (something the author would consider mandatory), the preceding orders and primates appear monophyletic, but their relationships are completely unresolved, with the exception of scandentians being the primitive sister to all others (idem, Figure 10). In the equal transformation weighting, Simmons acknowledges that with only a few additional steps, there are a large number of trees (indicating that the phylogenetic signal is very weak). 2. The fact that different anatomical systems give different results suggests that some of these phylogenetic signals must be wrong. If the corresponding data are kept, they will in any such analysis, consistently yield wrong signals. One problem is that similar functional requirements and other mechanisms may lead to common evolutionary trends or convergences. This is well-known for some locomotor and dental specializations; however, it may occur in other anatomical systems as well. Such homoplasies introduce consistent signals, which drive parsimony analyses to incorrect solutions. 3. The comparison of the trees obtained from the three data sets of Silcox (2001) and that from the summary data set shows that the total evidence tree primarily reflects the largest of the subsets—the dental one. It also reveals that this total evidence solution yields phylogenetic signals that were so weak that they had not appeared on the tree extracted from the subset giving the signal. The sister group relationship between primates and Toliapinidae, which appears on the total evidence tree, must come from the dental evidence because this is the only data set known for Toliapinidae. However, that relationship was not apparent in the strict or Adams' consensus trees of the dental data set at the family level, which is a subset of the total evidence tree (this relationship appeared in the dental analysis at the species level). This is a clear demonstration that the larger summary data set, as attractive as it may be, in fact produces very weak phylogenetic signals. Silcox (2001) is aware of the fragility of the node uniting primates and Toliapinidae. 4. The characters that have been recognized by all authors as having systematic importance should be weighted heavily. In Plesiadapiformes, the shape of the incisors is recognized as having more systematic significance than the dental reductions that occurred repeatedly. For example, Silcox finds that Picromomys is closely related to Niptomomys, something "rather surprising, in light of the fact that Picromomys lacks the characteristic I/1 morphology of microsyopids" (Silcox, 2001). She then rightly assumes that Microsyopidae is monophyletic excluding Picromomys, a choice with which the author agrees, but forces the conclusion that the methodology is unsatisfactory. To avoid having several more commonly derived characters outweigh the unique I/1 morphology, this unique morphology should be more heavily weighted. The deduction that the microsyopid I/1 is characteristic of the family is common knowledge of systematicians, and it should be translated into the cladistic analysis by an appropriate weighting procedure (see e.g., Neff, 1986). In conclusion, these cladistic analyses are unsatisfactory because in the search for "objectivity", they refuse to weight heavily characters that we know have high systematic significance (Szalay et al., 1987). As such, rejecting previously acquired knowledge is regressive. Secondly, in adding more and more characters and then more and more homoplasies between different anatomical systems of many groups, what is finally privileged is global similarity at the detriment of more specific signals; this procedure leads ironically in part to a return to phenetics (this is especially true when transformations are not oriented). The experience of systematics is that a small number of characters can diagnose many groups, including higher systematic groups. The astragalus of artio-dactyls, the toothcomb of lemuriforms, and the petrosal bulla of primates bear testimony that single characters or character complexes can mean a lot, and that such characters can be found in dental, cranial, or postcranial anatomy. Put in historical perspective, the differentiation of a higher taxon could be linked to a small number of characters. To avoid the trap of excessive data sets effectively driving a return to phenetics, different strategies are possible. One would suggest scrutinizing the data to try to eliminate the characters that are likely to introduce wrong signals. This is more easily said than done; however, during the course of anatomical studies, a number of characters have been shown to be not pertinent. Likewise, paleontological information usually leads to the elimination of derived characters shared by living forms, which are not present in early members of a group, and to the inclusion of more primitive character states that are known to be represented in these early members. Another idea is to try not to lose sight of the characters that have been shown by others to be crucial, in our case, crucial primate characteristics (related to vision, locomotion with grasping, and nails). Furthermore, the fossil record clearly demonstrates that there are features very unlikely to exhibit reversal. For example, teeth once lost are never regained. Strangely, Rose and Bown (1996) allowed such reversals that partly explain the bizarre results of their cladistic analysis of a group of plesiadapiforms. Likewise, Bloch et al. (2001) support a phylogeny in which a P/2 has "reevolved" in Carpocristes oriens; this is unlikely, although such a possibility must be addressed. There are morphological characters other than tooth presence that can be lost, without the entire morphology ever reverting to ancestral states. Unlikely reversals can help to evaluate or even refute some phylogenetic hypotheses, as is argued later. In this chapter, the author emphasizes the role of historical data and the importance of understanding character changes in polarity and in function. In doing the author finds himself in agreement with the position repeatedly advocated by (Szalay, 2000; Szalay and Lucas, 1996; Szalay et al., 1987) and with the suggestion that "perhaps it is time to return to scenarios about adap-tational history as better devices for understanding primate evolution" (MacPhee, 1991) and adds, especially primate origins. An evaluation of the Primatomorpha hypothesis is done first because its acceptance or rejection will determine the content and the systematic meaning of Plesiadapiformes. In the course of this chapter, Plesiadapiformes is used as a separate order of mammals—a choice which has become common (e.g., Fleagle, 1999; Rose, 1995) and will be justified later (following Szalay and many others, Microsyopidae is provisionally not included in Plesiadapiformes). Are Paromomyid Dental Characters Compatible with Dermopteran Origins? When Beard interpreted postcranial features of paromomyids as reflecting a gliding adaptation of a type similar to that of colugos, he included paromomyids in Dermoptera (Beard, 1990, 1991). He further interpreted the paromomyid dentition as convergent to that of the sugar-glider, Petaurus, and inferred a similar gliding and tree-exudate-eating adaptation for paromomyids. It is difficult to accept this interpretation, partly because paromomyid dentitions look extremely divergent from, and hardly ancestral to, those of colugos (see also Rose, 1995; Szalay and Lucas, 1996). They also seem as much adapted to insectivory as to exudate-feeding (Godinot, 1984). More importantly, the skulls of paromomyids are quite similar to those of ple-siadapids (Kay et al., 1992), showing very few characters indicating a link with dermopterans. The evidence concerning paromomyid dental adaptation and affinities is accordingly reconsidered. Figure 1. 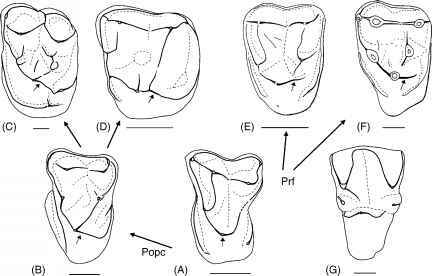 Drawings of left upper second molars of several archontans in occlusal views. A, Purgatorius; B, Palaechthon; C, Plesiadapis; D, Arcius; E, Nannopithex; F, Cantius; and G, Cynocephalus. All drawn at the same transverse width, posterior side on the right; scale bars are 1 mm. Small arrows on the teeth indicate the proto-cone in A; the postprotocingulum in B, C, and D; and the protocone-fold in E and F. The long arrows indicate steps of morphological changes; however, they do not represent true phylogenies. They show on the left the development of a postprotocingu-lum (Popc), a third posterolingual crest issued from the tip of the protocone, in plesiadapiforms, (C is a plesiadapid, D a paromomyid). On the right, they show the formation of a protocone-fold (Prf) or Nannopithex-fold, via the breaking of the post-protocrista and elongation of its posterior part in two primates (E is a microchoerid; F a notharctid); orientation of this crest is posterolabial. Upper molars of living colu-gos (G) seem primitively narrow in their lingual part. reinforcing the lingual part of upper molars (initially triangular in early mammals, having later become quadrangular in many groups). Of course, a structure, and even more a detail on a structure, can be lost, however not in any fashion. For example, in this case, one can find large plesiadapid teeth on which the postprotocingulum is weakly expressed (Figure 1C). However, in such cases, this happens to much larger species having quite different proportions and functional adaptations. This weakening and possible loss of the crest does not modify the acquired quadrate lingual shape of the tooth. Even with the possible complete loss of the crest (which would be coded as a "reversion"), there is in fact no reversion of the whole structure, no going back to an ancestral morphology. The living colugos, in spite of their specialized labial shearing crests, have transversely very elongated upper molars. These molars are primitive in their narrow lingual part (Figure 1G); it is not very likely that this is derived from teeth that would have been lingually broadened by a postprotocingulum (or a hypocone on a lingual cingulum). One should be cautious because there is a very long duration between the Early Eocene fossils and living species. On the other hand, these species remained relatively small, which renders more likely simple preservation of a primitive structure (large changes masking preceding adaptations are much more frequent when associated with a marked change in size—a change in niche). The teeth of the Plagiomenidae, putative early dermopteran relatives, are very specialized and convergent on those of living galeopithecids (e.g., Rose and Simons, 1977). Interestingly, the upper molars of Plagiomene and Elpidophorus, which are relatively lin-gually broad, do not show a trace of a postprotocingulum. Those of Elpidophorus have a hypocone at the lingual extremity of the posterior cingulum, strongly suggesting that those animals and their ancestors never had a postprotocin-gulum. Overall, it appears very improbable that the upper molars of galeop-ithecids, as well as those of plagiomenids, evolved from upper molars with a postprotocingulum. This dental analysis contradicts the cladogram of Beard (1993a), which implies such a morphological transformation. Concerning primates, Beard (1993a) considered them, as many earlier authors did (Hoffstetter, 1986; Szalay et al., 1987), as having primitively possessed a postprotocingulum, equated with a Nannopithex-fold. This is probably not true, but it does not greatly affect that part of his cladogram; this character has simply to be moved one node up on the main line. However, this is not entirely trivial because it eliminates the only non-postcranial character supporting the primatomorph node. Figure 2. Drawings of two plesiadapiform left jaws (A and B) compared to two right jaws of living dermopterans (C and D). Drawn to similar lengths; scale bars are 5 mm. Here, (A) is the primtive plesiadapid Pronothodectes (from Gingerich, 1976); (B) the Chronolestes, a primitive carpolestid or primitive plesiadapoid (from Beard and Wang, 1995); (C) the jaw of living Cynocephalus volans (from MacPhee et al., 1989); and (D) a juvenile C. variegatus (Anatomie Comparée collection, A-3958, M. N. H. N., Paris). Living dermopterans have three incisors: two of them pectinate (C). (D) shows details of I/2 and the erupting I/3. It seems impossible to derive a dentiton like that of living colugos from the dentitions of the early plesiadapoids, which have an enlarged I/1; and the other teeth between I/1 and P/4, including 1/2 and 1/3, very reduced. I/2 in an advanced stage of reduction (Bloch et al., 2002). Even the primitive plesiadapid Pronothodectes, and Chronolestes, which may be a primitive carpolestid or lie at the base of a plesiadapoid clade, have teeth posterior to I/1 much too reduced to be possibly ancestral to dermopteran incisors. Thus, the Galeopithecidae cannot be nested within the plesiadapoid clade (or a paromomyoid clade). Concerning upper incisors, they are lost in the living colugos, whereas paromomyids have the large multilobate 11/ typical of plesiadapoids (Gingerich, 1976; Godinot, 1984; Rose et al., 1993), and of paromomyids if they are considered as belonging to another clade. The known trends in plesi-adapoids seem not to be toward the loss of the upper I1. Overall, concerning both lower and upper anterior incisors, the evolutionary trend(s) largely started in paromomyids and their plesiadapoid relatives do not lead toward a dermopteran-like anterior dentition. In fact, to be possibly ancestral to der-mopterans, an animal would have to have kept three lower incisors, and to have increased the second approximately as much as the first—two conditions at odds with known plesiadapiforms. If we add the difficulties from the upper molars, the hypothesis of dermopterans being more closely related to paromomyids than to plesiadapids becomes so intractable that it is quasi impossible. The scenario would imply rooting paromomyids in a form as primitive as, or even more primitive than Purgatorius, with dermopterans branching off to one side and paromomyids on the other side converging in many characters with plesiadapids. It is not impossible; however, it would destroy the ple-siadapoid synapomorphies recognized by Beard and others, and require a new ad hoc dental scenario. Known dental trends of paromomyids and other plesiadapiforms make it so unlikely that one of them could be ancestral to dermopterans that this hypothesis should be considered as quasi impossible, and thus abandoned. It is not definitively proven to be impossible, but decisive new evidence would be needed to justify reconsideration of this hypothesis. It is similarly intractable to adjust dental characters to the cladogram of Bloch and Boyer (2002), which proposes a sister group relationship between carpolestids and primates, nested within plesiadapoids. It would seem "easier" to redevelop two vertically implanted lower incisors than to evolve the dermopteran incisal device; however, this is likewise so opposite to dental trends in plesiadapoids that any nesting of primates or dermopterans within plesiadapoid families is dentally quasi impossible.